After several days of on again, off again torrential downpour, the sun finally came out on Sunday. So out came the saw and the camera to take some photos for a tutorial/how-to on some of the basic cuts you can do using a scroll saw. 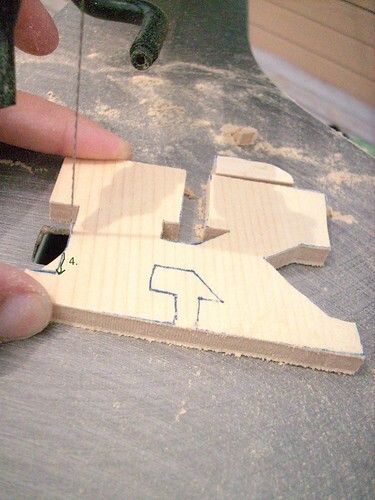 Here is a quick step by step of how I cut the letters out with the saw. 1. As I said in the last post, I printed out a template alphabet on my printer, cut them out and traced the cutout onto 1/4 inch plywood. 2. I then rough cut between each of the letters using the scroll saw, just to seperate them. This made it easier to cut them in more detail. 3. Now the fun begins. With each letter, I did the "easy" cuts first. All of the big, straight lines, external right-angles and big curves. You can see an example in the cuts I drew in below. I did the big curve of the R and the next small angle as cut #1. Then I came from the other edge and made cut #2, connecting with the first cut so that excess is removed. The final cut #3 from the bottom take off the remaining excess. 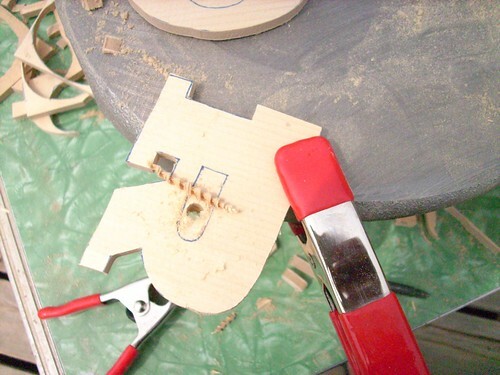 The scroll saw blades only cut going one direction, so it is easy to make a cut and then back the blade out to reposition the blade, or make another cut. Always hold the piece securely when cutting so the blade doesn't jerk it out of your hand. 4. The internal cuts are a little bit more tricky. Again, you will do the easiest cuts first, the straight cuts. In the photo below, the cuts 1 & 2 were done first. Each time I backed the blade out. For cut #3, I followed the path of #2 again, but about halfway in, I went in a curve to line up with the longer line parallel to the right side. This cut intersected with #1 so that whole piece came off. Then I made the fourth and final cut taking out the small piece that was left. 5. Center cuts on letters like R, B, Q and O require a few extra steps. 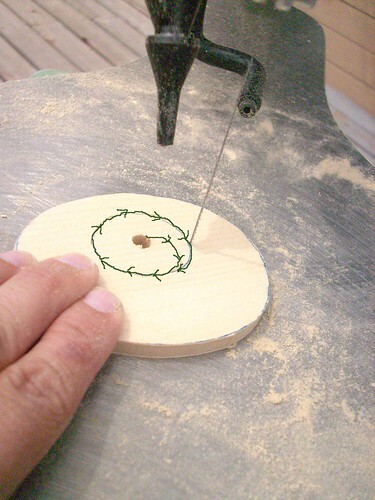 First you need to drill a hold in the center of the piece that you are going to cut out. You will need to be sure to use a drill bit that is big enough that the blade can fit through the hole created. If your piece is small like mine, I would recommend clamping the piece to a secure surface. Just make sure the spot you want to drill is not directly over the surface, or you will be drilling a hole in your table. Next you will need to remove the blade from the saw, insert it through the hole in the piece and then reattach the blade. 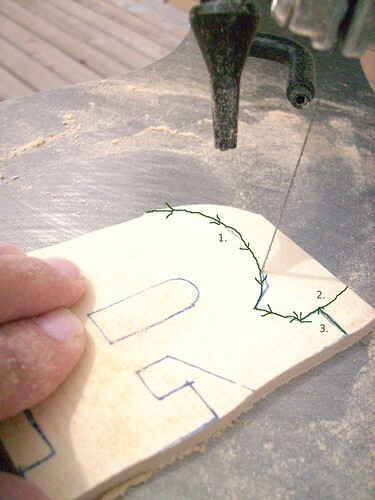 Once this is done, you will cut from the drilled hole to the edge of the line and follow the line until the piece is completely cut out. In the example below, I used a spiral to connect to and follow the edge of the inner circle in the "O". When you have finished the cut, the center piece will come off completely, but the main letter will still be stuck around the blade. You will again need to remove the blade to take off the letter. NOTE: Because I can be a bit accident prone, in addition to shutting off the saw to remove the blade, I also unplug it or shut off my power strip, just to be doubly sure that I won't accidentally cut of an appendage. This may not be necessary for everyone, but when it comes to power tools, my mantra is "know thyself" and adjust accordingly. Most accidents are user errors. So that is the basics of scroll saw use on this project. After the pieces were cut, I sanded all of the edges and corners. Next I will need to attach magnets, but I haven't found ones that I am happy with. As soon as I do, I will give you an update on the project. Please let me know if you have any questions! So great! And fabulous tutorial. I think we need to do a tool trade...I've got lots of bigger blades, but I think your lil tool is just the coolest of them all. Let me know if you need to borrow bandsaws, sawmills, a drill press, large planer (and small planer), edgers, and any variety of circle saws! Heritage Timber has an abundance of tools. Mind you some of these are multiple tons so you would have to work at my shop...but if you are ever up for a field trip - let me know. And we can get working on the table ends made out of 12x12s too. 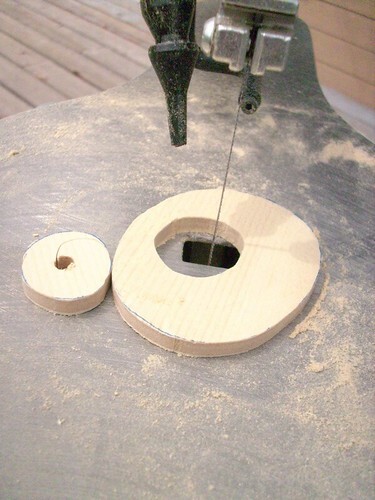 Quick suggestion on the scroll saw, you can cut more than one letter at the same time. Just tape several pieces of wood together first. 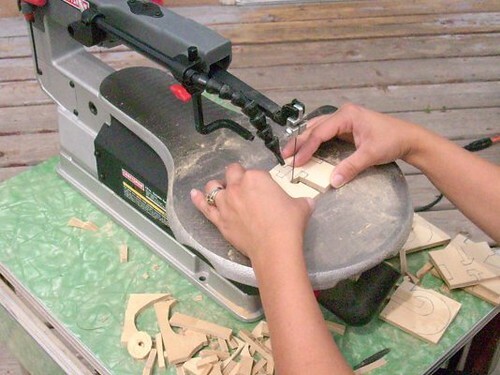 You can cut up to 2" thick wood, but I would recommend 1" to 1-1/4" thick at max. 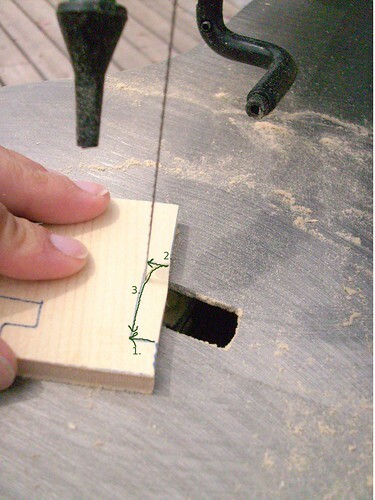 A responding saw is an electrical cutting device in which the slicing activity is proficient through the push and draw responding movement of the edge (as opposed to turning it). It is utilized to cut metal, wood, drywall, mortar, and tubing among different materials. It is most usually utilized as a part of the development, annihilation, plumbing, window fitting, and electrical work regions.